The increase in apartment vacancies experienced during the first half of 2009 appears to have carried over into the second half of the year. According to quarter apartment market reports produced by Reis Inc., a New York real-estate research firm that tracks vacancies and rents in the top 79 U.S. markets, apartment vacancies are at their highest point since 1986. The U.S. vacancy rate has reached 7.8%, a 23-year high. What’s more troubling is that the rate is expected to climb further in the fall and winter. The 2nd and 3rd quarters are considered the strongest periods for rental landlords because they are popular times for people to move. But this year, “vacancies just continued rising,” notes The WSJ, citing Victor Calanog, director of research for Reis. 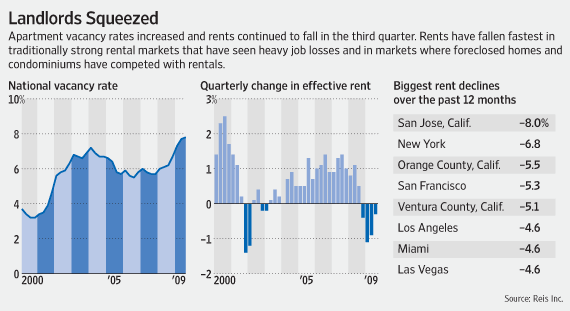 Sharp rise in vacancy, as more would-be renters keep moving in with family and friends during periods of job loss, caused average rents to decline. During the 3rd quarter, vacancies increased in 42 markets, causing rent to fall nationally by 2.7% on a y/y basis, to around $972. Omaha, Neb., saw the largest rise in vacancies, with the rate rising 1.1% to 7.4%, followed by Memphis, Tenn., Indianapolis, Raleigh and Tacoma.